Note: Diagonal steel straps; steel cords inside frames. M.A. Bradley et al., Cleveland, OH. 20.5 + 32 + 54 x 42", 900hp @ 80rpm by S.F. Hodge Co., Detroit, MI (1888). 11 x 12' @ 150# steam scotch boilers by Lake Erie Boiler works, Buffalo, NY (1888). Point Edward, ONT. St. Clair River. 1888, May 7 Enrolled Cleveland, OH; speed 11mph pulling a schooner; ran Cleveland - Duluth, MN with coal & ore; towed barge AHIRA COBB. 1888, Jul Collision with PACKER near Stay Island, St. Clair River. 1888, Oct Collision with PALMER. 1889 Towed barge JOHN MARTIN. 1892, May Ashore Windmill Point outside Buffalo with wheat from Duluth. 1892, Jun 2 Collision with barge MARVIN at Port Huron. 1897, Nov 6 Broke wheel, Lake Erie. 1901 Rebuilt as screw steamer; 1 deck, 2 masts, 283 x 40.3 x 25.5', 2766 gross / 1913 net tons. 1903 Sunk near Bar Point; extensive damage. 1907, Sep 3 Aground Sandusky; released. 1909, Jun 5 2266 gross / 1913 net tons. 1915 Laid up Erie, PA.
1918, Jul 9 Enrolled Port Huron, MI; owned Joan Steamship Co., A.H. Langell, Lakewood, OH, president; rebuilt 283 x 40 x 23.7'; 2161 gross / 11808 net tons; never operated, sank at it's dock due to ice jams. 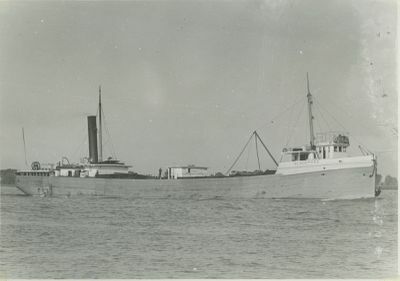 1923, Dec 23 Owned Geore Peel, Chatham, ONT; sunk at Point Edward as breakwater.